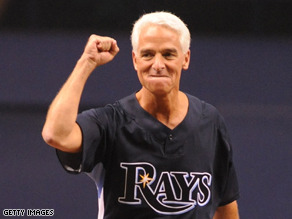 Crist is the clear favorite against primary and general election challengers, a new poll suggests. (CNN) - One week after Florida Governor Charlie Crist announced he would campaign for the Senate next year rather than run for re-election, a new poll indicates he comfortably leads his primary and general challengers. The popular first term governor announced last week that he would forgo re-election in 2010 and instead run for the seat being vacated by retiring Senator Mel Martinez, a fellow Republican. Crist was immediately backed by some top Republicans in Washington. A new Mason-Dixon poll, the first survey to question Florida voters since that announcement, indicates that if the Republican primary for the Senate seat were held today, Crist would easily top former Florida House Speaker Marco Rubio 53 percent to 18 percent, who is considered more conservative than Crist. The poll also suggests Crist would beat Democrat Kendrick Meek, a Congressman from south Florida, by 31 points and would defeat state senator Dan Gelber by 35 points in hypothetical general election matchups. "Crist seems to be popular throughout Florida, but he also benefits in early polling from being the only Senate candidate who has been on a statewide ballot," says CNN Polling Director Keating Holland. "The challenge for the challengers is to boost their name ID in parts of the state where they have never run before. If one or more of them do that, the election results in 2010 may look nothing like today's poll." The Mason Dixon poll was conducted May 14-18, with 625 Florida voters questioned by telephone. The survey's sampling error is plus or minus four percentage points. Please, Christ seems like an ok guy but he's still a rethuglican/conservative and we don't need any more of them ruining this country! Florida, SAY NO TO RETHUGS! I'm sure Rush Limbaugh looks at Charlie and says, "I'd do him!" Anyone who wears a RAYS" UNIFORM is a LOOSER. left-wing–what are you saying? are gays not allowed to run for office? I agree with the majority, Bush was an idiot, a terrible president. BUT my life was a lot better under Bush than it is not under Obama. AND my future looked better under Bush than it does under Obama. Obama is going to tax my health care benefits? Are you kidding me? That is a disgrace! I worked so hard the past 10 years to earn this benefit. It's just like the democrats do with home ownership, they don't feel homes should be earned, it is deserved just like every other benefit in this country. It's coming to a point where hard work means nothing because you'll get less than drugged out, lazy, non-working hippies and thugs. I'M SICK OF IT!